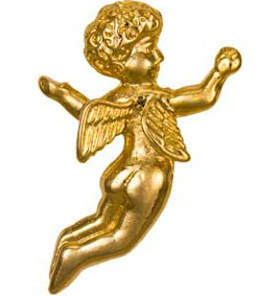 Gold Flying Guardian Angel Pin Gold Plated 1 1/2 inch. Wear this flying guardian angel pin on your shoulder to guide you through the days and nights and brighten your life. Attach to packages, Guardian angle pins. Inspirational angel pin. Guardian Angel Card. Unisex angel could be male or female.